Ok, I’ll admit I don’t like goat’s cheese. I used to, until I had this experience with it (warning: not for the faint of heart). Anyway, everyone else seems to like it, so I made this despite my taste aversion. My husband and sister thoroughly enjoyed this salad in its entirety, and I enjoyed sneaking pieces of roasted squash, so we’re good here. We seem to have butternut squash in the grocery store year-round, but obviously it’s more of a cold-weather food. Yeah, it’s probably a bit early to post this, but that’s ok. The dried cranberries and pumpkin seeds add more autumn flavor and satisfying texture. Basil adds that wonderful herby freshness. The honey garlic dressing is super simple and further enhances the sweetness of the squash. 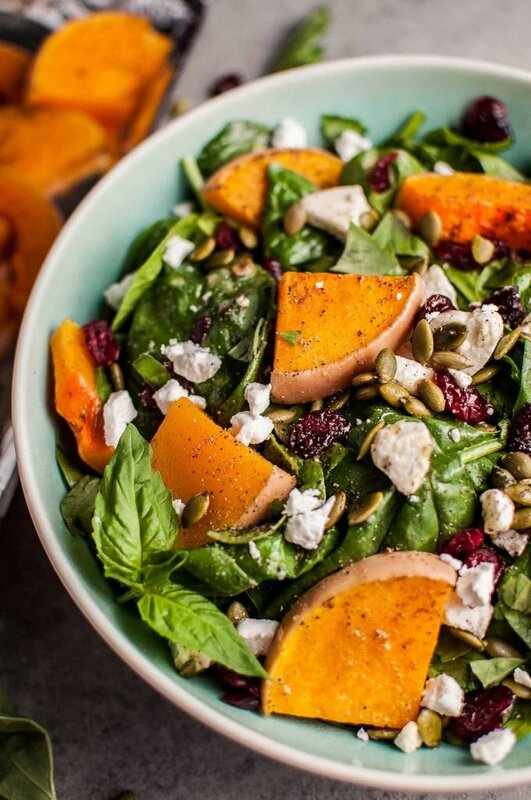 Hope you will enjoy this roasted butternut squash spinach salad recipe! Preheat oven to 400F, and move the rack to the top third of the oven. Line a baking sheet with tin foil for easy clean-up. Prepare the squash by cutting the ends off, then slicing it in half lengthwise. Cut each half into 1/2" slices width-wise so you end up with half moon shapes. Cut the pieces in half again to make them more bite-sized. Place squash slices on the baking sheet and toss with about a tablespoon of olive oil and some salt and pepper. Meanwhile, combine dressing ingredients to make the dressing (I used a jar). Refrigerate until needed. Once the squash is cooked, let it cool while you prepare the rest of the salad. Add spinach to a large bowl and then add the dried cranberries, pumpkin seeds, goat's cheese (crumble it with your fingers), and basil (tear it into small pieces). Toss salad with the dressing and squash and serve immediately. This makes a large salad (four entree sizes or 6+ appetizer sizes), so the recipe is easily halved. Squash can be roasted a day ahead and refrigerated until you need to assemble the salad. OMG, You don’t like goat cheese? I LOVE IT! Needless to say I didn’t click on that link because I don’t want to stop loving it! 😉 This salad is gorgeous, girlfriend! Gimme all the roasted butternut squash — seriously my favs! But paired with spinach and goat cheese?! HEAVEN! I could eat this daily! Pinned! Cheers! Lol yeah… I used to love it before the incident hahaha. I don’t know how likely it is to happen to anyone else, though… so I think you’re good 😉 Thanks for pinning!! I LOVE goat cheese!! But, then again, I love pretty much any cheese! This salad looks so scrumptious, Natasha. And that honey garlic dressing sounds perfect! We get squash pretty much year ’round here too and it’s just delish, especially when you roast the seeds too 🙂 Pinned! Have a great week! Love this Natasha! Perfect for the approaching fall! What a gorgeous looking salad! I didn’t know you can actually eat the squash skin. Thanks, Julia! Yeah, the skin really isn’t bad. I wouldn’t keep it on for every use of the squash, but it sure saves time for some recipes. What a colorful and delicious looking salad! Thanks for sharing!